A few years back, my husband Duncan and I never imagined we would become roving retirees. We envisaged spending our time in our hometown of Sydney, catching up with friends, walking, eating out and watching the latest movie releases. But we came to realise a run-of-the-mill retirement life wasn’t for us. We wanted more. We wanted adventures. We wanted to relive our youth and now we are doing just that. Wine, walking and food tours are just a taste of what our new life brings! We travel to destinations we only dreamed of, staying for as long we like. Recently we spent three weeks in Dubrovnik, Croatia where not only did we have excellent food and wine, we also enjoyed tours of the Old Town and travelled to Mostar in the neighbouring country of Bosnia and Herzegovina. We’ve long been spoilt by Aussie and New Zealand wines and regularly sing their praises. But it might surprise you to learn that Croatia is no slouch when it comes to wine either. You won’t pick any up at your local bottle shop though as the boutique wineries here make enough for their local market and no more. An hour’s drive from Dubrovnik, we toured the Peljesac Peninsula where we were impressed by the quality of the wineries we visited and the local dishes that accompanied the tastings. Our guided tour, with a local sommelier, lasted for about six hours and cost $150 each. 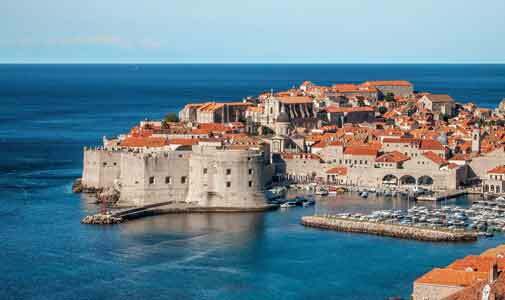 Dubrovnik’s iconic tourist attraction is the ancient city walls and the old town. Game of Thrones fans will know this area as “King’s Landing”. To enjoy the walls at a leisurely pace we recommend walking them as soon as the gates open in the morning. Dubrovnik is popular with cruise ships and once they dock, the walls and the old town can become very crowded, especially during July and August. But the breathtaking views over the old walled city, the surrounding countryside and the small islands are spectacular. Pace yourself, it will take you close to two hours to enjoy the experience and don’t forget your water bottle. The cost is $32 per person and there are cafes along the way if you need to rest, enjoy a coffee and take in the view. If you want a break from the hustle and bustle of Dubrovnik, we would suggest visiting the small town of Cavtat, 22 kilometres from Dubrovnik. Along Cavtat’s waterfront you’ll find several restaurants offering creative menus and dishing up the best of local seasonal produce in a stunning setting. After your meal a walk around the scenic headland with its distant views to Dubrovnik is highly recommended. For a ‘sundowner cocktail’ with views nothing short of heavenly, head inside the walls to the ‘hole in the wall’ Buza Bar. It’s a little private spot of Dubrovnik that only the locals and a few savvy travellers know about. Follow the locals and head there early to grab the best seats for the setting of the sun. Another popular sunset spot, providing you’re not afraid of heights, is taking the Cable Car to the Panorama Restaurant at the top of Mount Srd just outside the City Walls. Reservations are required, especially at sunset, but there’s little better than a glass of wine or a local beer while you dine on local cuisine watching the orange sun set over the Croatian Islands.